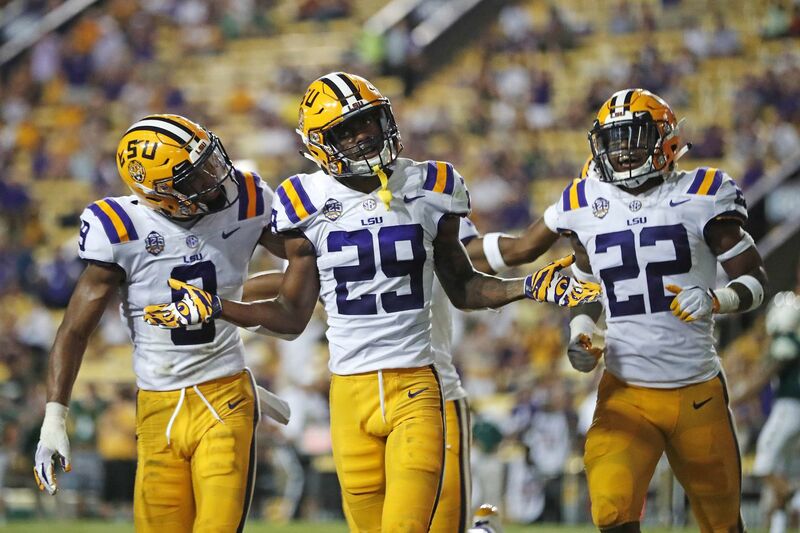 LSU cornerback Greedy Williams (29) celebrating his interception with safety Grant Delpit (9) and cornerback Kristian Fulton (22) in the second half of a September game against Southeastern Louisiana. Who are the best cornerbacks in this year’s NFL draft? Ben Fennell is an Emmy Award-winning producer, editor and researcher across several media platforms, including NFL Network, ESPN College Football, The Athletic and Eagles Game Plan on philadelphiaeagles.com. He is analyzing the draft for The Inquirer, breaking down the best player, the riser and the sleeper at each position. Today, in part 7 of our series, he looks at three outside cornerback prospects and three nickel cornerback prospects. You can follow him on Twitter at @benfennell_NFL. Ben’s take: “Greedy looks like he was born in a press-corner lab or petri dish. He has long arms, long legs, long frame. The big question with that, though, is he’s so athletically gifted that his technique is a bit of a mess at times. His footwork is a bit of a mess. But he’s got great ball skills. He’s got the length, the speed. For a 6-2 guy to run a 4.37 40 is impressive. “He just needs to dial back the aggressiveness, the sloppiness with his mechanics. If he is coachable, he can become one of the best cornerbacks in the game. He’s that good. He has that many gifts waking up in the morning. He just needs to refine his technique. “He’s out of the [Dominique Rodgers-Cromartie] mold. DRC was incredibly talented, but also had some issues with discipline and technique initially. But you can’t teach that length. You can’t teach that speed. And his coverage instincts are just very impressive." Justin Layne (2) is a big cornerback who can run. Ben’s take: “Everybody in the NFL is looking for big corners that can run, and this guy can do that. What’s different about him is he showed up at Michigan State as a four-star receiver and was moved to the defensive side of the ball because they had some injuries at corner. “When you get a four-star receiver, you’re getting a guy with great ball skills who isn’t going to panic when the ball’s in the air. The downside? He’s still learning the cornerback position. He’s still very raw on some of his technique. He’s still very raw on some route recognitions and route-concept identification. “I saw him in person early in the season against Arizona State. I watched him against N’Keal Harry, a big, physical receiver. It was a great high-point battle all day. That game showed that Layne can battle with those big 225-pound receivers. He’s just a little funky with his technique. But he’s got the tools and he’s got the size. His stock as a cornerback still is evolving and rising just from his acclimation to the position." Sean Bunting is projected to be drafted in the third or fourth round. Ben’s take: “He tested off the charts with a 4.42 40, a 41.5-inch vertical jump and 10-6 broad jump. He was All-MAC. He was his team’s defensive player of the year. “Just 39 percent of the passes thrown his way were completed. He has long limbs, fluid hips. He’s very physical at the catch point. He has that my-ball mentality. He’s a willing tackler. He can find the ball down the field. “His biggest problem is he played at Central Michigan, wasn’t on TV, and doesn’t have a lot of buzz in the national spotlight. But when he put up those numbers at the combine, he really opened up some eyes and made people go back to take another look at his tape. “With this cornerback group being a hodgepodge on the back end, I could see him working his way into Day 2. At worst, he’ll be one of the first picks on Day 3 in the fourth round." Ben Fennell expects Florida's Chauncey Gardner-Johnson (right) to be drafted in the first or second round. Ben’s take: “He’s a corner who kicked inside to play nickel for the Gators. He didn’t play in their base defense, which is a little bit of a concern for me. Why wouldn’t you have one of your best players on the field at all times? If you’re not on the field in base in the SEC, are you going to be on the field in base in the NFL? “But he has great coverage ability, great instincts. He can click [diagnose] and close. He has really good ball skills. He’s fast. He’s aggressive. He’s not the best tackler in the world. He’s more of a cornerback pedigree that can play in the middle of the field. “But he’s tough. He’ll stick his nose in there against the run. He’s a decent blitzer. He’s a guy that sees it and hits it. You can see the click and close, the short-area burst, the ball skills. Someone who will be a playmaker for you in the slot." Darnell Savage (4) is an undersized safety who fits the prototype of a nickel cornerback in the NFL. Ben’s take: “Savage is another undersized safety who is perfect for the NFL nickel mold. He’s compact and undersized, but has the IQ and the quickness and the foot speed and the click-and-close ability to be a very good NFL nickel. “He plays aggressively, but is patient with routes and doesn’t panic when the ball’s in the air. He plays with that my-ball approach, which is what you want because it leads you away from pass interference and grabbing and panicking in the route. When you see that ball [in the air], it’s your ball, too. “Savage plays with great instincts. I thought he played outstanding against Ohio State last year. They lost in overtime, but he made a bunch of great plays. He tipped one ball in the air and allowed a teammate to return it for a pick-six, and he had a great pass breakup on a stick nod [route] in the end zone against the tight end. “This is a guy that can blitz for you. He can stick his nose in there in run support. He’s just a little undersized. But he’s a spark plug. He’s a playmaker." Jimmy Moreland of James Madison was invited to play in the Senior Bowl in January. Ben’s take: “Interesting guy who was invited to the Shrine game and played so well that he parlayed it into a Senior Bowl invitation. He was the CAA’s Defensive Player of the Year. Had 44 starts at corner at JMU. “He’s a great press corner, both left and right sides. He’s going to help someone on special teams as well as defense. He blocked seven kicks in high school, then had five blocks his freshman year at JMU. “He’s just one of those guys who has a nose for the football. A ball-magnet guy. He had 18 interceptions at JMU, six for touchdowns. Forty-five pass breakups. He’s undersized, but he’s feisty."